Neukrotimy is a Project 1135M Frigate. 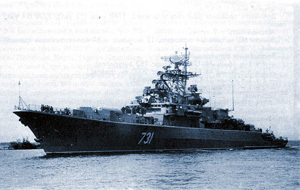 The ship was laid down on January 22, 1976 at Yantar shipyard in Kaliningrad; launched on September 7, 1977; commissioned on February 17, 1978; decommissioned on June 29, 2009. In 1978 and 1985 the ship paid visits to port of Rostock (East Germany). In 1982 it called at ports of Luanda (Angola) and Lagos (Nigeria). In 1985 the ship visited port of Gdynia (Poland). The frigate also called at ports of Kiel (Germany), Stettin (Poland) in 1990, Amsterdam (Netherlands) in 1991 and Rotterdam (Netherlands) in 1997. In 1981, 1984, 1998, 1999 the ship won the Navy Commander's Prize for artillery firings. In 1981 and 1988 the ship's group won the Navy Commander's Prize for AD firings. In 1983 and 1998 the ship's group won the Navy Commander's Prize for ASW firings. In 2005 during naval parade in St. Petersburg the frigate suffered hull damage while pyrocartridge explosion at the board. The ship was released from the duty of parade flagship due to heavy leakage and laid up for repairs at Severnaya Verf shipyard. On December 2008 there was a fire on board caused by short circuit; assistant officer of surface ship brigade's electromechanic service died. On 3 October 2012, the ship sank at the quay of Baltiysk Naval Base due to decay condition.